Since my recent move to a new house I’ve been busy unpacking a lot of boxes. Although this has been rather overwhelming today I was absolutely delighted to find a box with the intriguing label “travel souvenirs.” Suddenly I didn’t care how long it might take to unpack everything. I carefully looked inside to find all kinds of fun souvenirs. There were postcards, key chains, scarves and jewelry as I sorted things out. But how to begin – by country, type or just random? Before I actually started putting things away in different drawers I took the time to get pictures of some of my favorites. They all have wonderful memories of past trips and I’m looking forward to adding more in the future. 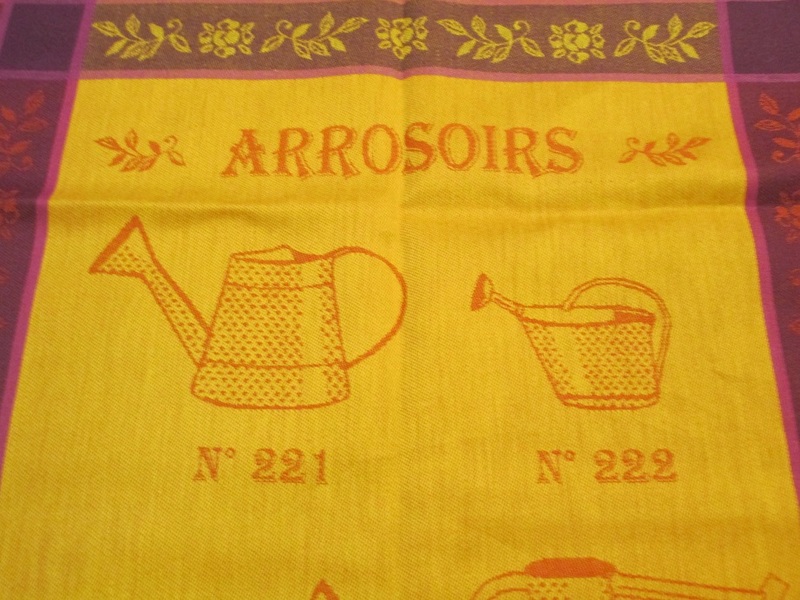 Here is a dish towel from Provence that I will never use! This entry was posted in England, France, Italy, Spain, Travel and tagged souvenirs. Bookmark the permalink. Those are some of the most lovely and fun souvenirs I’ve seen! My daughter absolutely loves cameos and has a small collection of them, so I know she’ll appreciate seeing the picture of yours. Isn’t it fun to rediscover these wonderful treasures?! I just like to admire some of these souvenirs – I do wear the jewelry and scarves though! I do too – I’ve found some beautiful pieces to bring home! I love bringing home travel souvenirs. After many years they bring back beautiful memories of places I’ve been. That’s just the way I feel about travel souvenirs. They are really special! What a lovely find to bring back memories. Thanks – unpacking can be very interesting! Yes… Especially when you find a hidden treasure you may have forgotten about. I bought a cameo too on my last trip to Italy, in Capri. I try to be careful with my souvenirs – one requirement is it should be something I can wear or use. I love the mug. It must have a story. Aren’t the cameos from Italy beautiful? I like your requirements for souvenirs too. It’s so nice when they are useful! Memories – you are making the very best!!!! To me, that is the way to celebrate life! Thanks and I really agree with you – happy memories are priceless! All cute, Meg. I like the towel the best…and so easy to pack when you have a full suitcase to lug around! It’s lovely to have souvenirs of the places you visited. I am on holidays at the moment and I will bring back something to remind me of my stay in The Cotswolds. Have a wonderful holiday and I’m sure that you’ll find something charming to bring home with you! Whimsical and Delightful……….how fun to relive the trips through your treasures. Those are two of my favorite words – memories of travel are so special! I am a hoarder disguised as a “collector.” I love it when I stumble upon boxes of treasures like this. I look through everything and reminisce, then put the box right back so I can re-discover it in the future again. I guess you ate all the gelato. ;) I liked seeing your souvenirs. Wonderful souvenirs, Meg! Remember to look through them again from time to time to enjoy the memories! Thank you Shirley – that’s a good idea and I’ll be sure to look at them often! Lovely souvenirs! My favorite is Italian car among them. Thank you – that is a souvenir that really reminds me of being in Italy! Oh how fun it must have been to open that box and all the memories that had to come back to you. It was wonderful to step back in time and enjoy a few minutes reminiscing. It’s amazing how each thing has its own memory! Such fun to rediscover souvenirs. A good idea to take photos of them, as well. I really liked seeing everything again – they are like old friends with great stories! Lovely souvenirs! And they must have stories as well! Thanks – I have such great memories when I see them! It may be tough but someone has to… ;) I never imagined life could be this good. BTW, that little mug is adorable! I thought that it was really cute too!